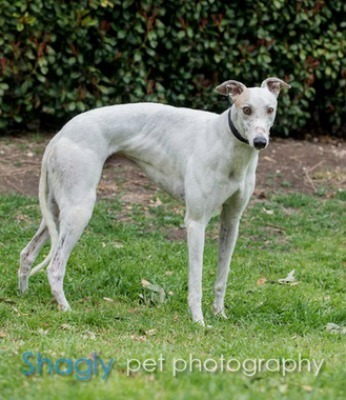 Thrush is a 2½-year-old white male with a few red spots born July 18, 2012. His sire is Coldwater Konow and his dam is Slinky Lady Bee. Thrush has just 2 races on record at Greyhound-data.com at Derbey Lane in Florida in June 2014. He decided early on that he'd rather retire! Thrush has passed an initial cat test and is living with them in a foster home. 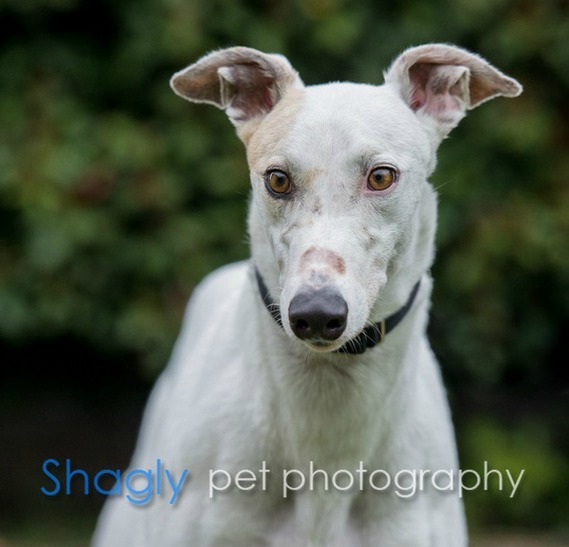 Thrush is a handsome young male who will steal your heart. He is house trained and uses a dog door. Thrush has tested cat trainable and has been living in a home with a cat. He still shows alert interest when he sees the cat and I never leave them unsupervised. I think he can be trained to be cat-reliable given the right adopter. He lives with a feisty Chihuahua and is small-dog safe. He has an interesting personality. He is moderately independent, which means he is not super-cuddly or Velcro-like. He does like to stand for a face and shoulder rub, but only asks for a little before he's off to explore outside or to find a vacant bed. He easily engages the other hounds for play and quiet yard patrols, but is not trying to climb the social ladder. He gets along great with my other dogs and fits into the pack just right. Because he is independent, he might make a good only dog. Some greyhounds, even large males, are almost willowy with their long limbs, but not Thrush. He's more compact and muscled. He has unusual amber-colored eyes and the most adorable spotted ear. His coat is in good condition and he eats everything offered in a bowl. When taking a treat from the hand, he seems a little unsure about how to pick it up. He curls back his upper lip and gingerly takes the treat with his tiny front teeth. His teeth chatter at meal time and when he is extra happy. Thrush wakes up full of joy and energy every morning, and is a delight to host while he transitions from athlete into your best friend.